If you did not pay attention to quiet developments in the world of physics over the past several decades, you missed some very interesting important discoveries. Today, physics is not what our parents or even any of us who went to high school or university in the last quarter of the twentieth century learned because the physicists have been busy learning a lot of new things. Physicists and mathematicians came up with “chaos theory,” which essentially says that among what appear to be random behavior, underlying patterns exist that can be affected by conditions, some of which may have come into existence early in the condition and that some minor change can radically alter circumstances. The notion that a butterfly flapping its wings in one part of the world leads to a major storm in another part of the world, the straw that broke the camel’s back, or the assassination of an Austrian nobleman rapidly unleashing the start of World War I are all examples of something going on that cannot be explained rationally the way that history teaches us to think of the cause-and-effect of events. Scientists study the role of chaos to identify deterministic systems to understand how to predict behavior in what are uncertain circumstances, such as in weather forecasting. A discussion that brings up the related, but more familiar notion of randomness, as some sort of mitigating influence on events that we know as the lack of a predictable pattern of behavior. Gambling with dice leads to unpredictable results. The fact that World War I burst onto the world with such devastating consequences, or subsequent events of many sorts unfolding that we elegantly label “unintended consequences,” are manifestations of randomness. Coupled to chaos theory, scientists ask, why did one particular grain of soil all of a sudden precipitate a land slide? The two ideas led scientists to recognize that much in nature lives in a critical state of tension, and we are learning that so does human behavior and society at large. Examples include the slightly heavier bug that normally could walk on the surface of a pond that breaks through, or the “final straw” minor event that causes one Afghan tribe to attack the other over what, in a dispassionate way, might seem a trivial provocation. 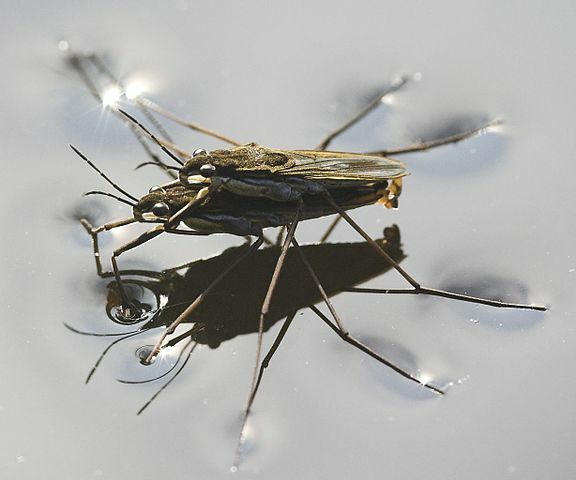 Water striders using water surface tension when matting by Markus Gayda. CC BY-SA 3.0 via Wikimedia commons. Historians, sociologists, economists, and cultural anthropologists are responsible for explaining after the fact why events happened or predicting accurately what will happen. As physicists learn more about how chaos works—they already know that it exists—will their findings inform the work of the humanists and social scientists? Will they make these non-technical physics-math-avoiding folks better at their work? Will consumers of their research get a better product in the form of deeper insight that is more definitive than, say, the half dozen alternative reasons for why World War I happened? Will we learn that the quick release of social stress in one part of society sets off many other events of a profound nature—think of them as avalanches—elsewhere, as American political commentators are beginning to think is happening as a result of Donald Trump winning his bid for the presidency? Already historians, political scientists, and sociologists are learning that a nation’s political and social structures function on the edge of instability, a point increasingly made by science writers, such as Mark Buchanan, but instinctively understood by some historians, such as the late French scholar Fernand Braudel. It would appear that people in all disciplines need to learn more about living in a critical state of tension to avoid being the fat bug that breaks through the water, the public official who takes an action that sets off a chain of unanticipated negative events, or the scholar who needs to up their game when analyzing the cause of past or present events. 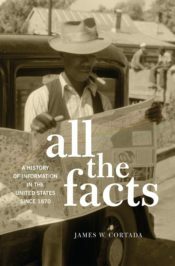 A lesson from the history of information is that when new insights and ways of analyzing circumstances become available, they seep into other disciplines, often quickly. They are appropriated to new uses and normally are seen as effective. Are we now at such another point, this time where humanists, social scientists, and even historians should understand chaos theory, the role of randomness, and start using statistical tools and Big Data analytics as part of their tool kits and worldviews? The potential implications of this are fascinating; for instance, we should expect the unexpected and learn how to best respond to this reality. Historians will think more like gamblers by worrying about the odds of something having happened and sociologists will work more like weather forecasters. We citizens acknowledging that we have lived these past half dozen decades in a period of relative calm when compared to earlier historical eras. The collapse of civil society in many parts of the Middle East, while triggered often by unintended consequences, actually reflecting living conditions for most of human history. For the historian it all will boil down to using chaos theory as a way to reconcile notions of causality with what actually happens. We need to deal with the critical grain of sand and with the straw that so badly hurt the poor camel. Headline image credit: dice by Peaches&Cream. CC BY 2.0 via Flickr. How arrogant to assume that humanities scholars have chosen their fields because physics was too difficult. That way of thinking evinces deep ignorance about the humanities and the kind of attitude that will not encourage the interdisciplinary exchange and understanding this article calls for. I’m not an entomologist, but I think they’re mating. Hi Roger, that is how the image caption is written on Wikimedia Commons so we have to follow that I’m afraid. Thanks for taking the licensing seriously! CC-BY-SA only requires you to attribute the creator though, you’re still free to choose your own caption. In addition, anyone can edit Wikimedia Commons, so i just corrected the mentioned typo.